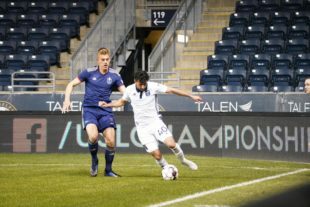 Bethlehem’s international and Academy teenager experiment challenged and resisted a strong North Carolina FC squad in the Steel’s home opener at Talen Energy Stadium, but breakdowns clearing one attack led to the game’s only goal for the Carolinians as Steel FC lost 1-0. The result was just, since North Carolina had more shots 14 and shots on goal 9 during a game in which former USMNT interim manager Dave Sarachan’s side concentrated on defense and counterattacking, save for the ten minutes immediately after halftime. After the break, Carolina switched gears and carried the play to Bethlehem until Matias Lomis scored with a decisive far upper corner strike on the half volley in the 51st minute on a lovely assist from Steve Miller. Thereafter, they slowly reverted to defending and countering and held off an increasingly desperate and determined Bethlehem side until the final whistle. Overall the match was open and even with the difference being the respective finishing quality in the respective boxes. Bethlehem started an 18-year-old right wingback and a 16-year-old academy midfielder as their strikers because none of their four regular attackers were available. Unofficially, the Bethlehem game roster mean age against North Carolina was 20.6. Bethlehem had only one serious chance to score in the first half. At the 42nd minute James Chambers served a free kick to the far post for a flick on by Chavany Willis that was just tipped wide of the post by Carolina keeper Alex Tambakis. The game’s most dramatic moment occurred at 45:55 of first half stoppage time when Nate Harriel made took striker Marios Lomis down in the box for a deserved but perhaps unnecessary penalty. Carlos Miguel Coronel, on loan for a tune-up before his Union match next week, not only saved the penalty kick, but also saved Lomis’s shot off the first save’s rebound to end the half. Several times goalkeeper Coronel illustrated the range and anticipation required of the sweeper keeper in the new system during Steel FC’s never-say-die attempts to secure a point. In the most extreme instance he was easily 45 yards off his line and closer to the touchline than the center circle. In the 86th minute a cross from the right from Issa Rayyan that culminated a sequence of serious pressure grazed Zach Zandi’s head inside the six in front of goal, but Reading United’s former leader needed to be an inch and a half further forward to have deflected it into the net. Bethlehem play next on Sunday, March 24 at Talen Energy Stadium, when they’ll host expansion side Memphis 901. Thee match begins at 6:00 p.m.
Playmakers: Bethlehem created offensive thrust through two primary means. First was the combination of Chambers, Willis and Zach Zandi in the central midfield. Steve Kingue’s 15 minute cameo at the end added to that combination’s threat and effectiveness. Second, especially in the first half before Sarachan called for adjustments at the break, Jamoi Topey and Matt Real combined repeatedly to attack North Carolina’s right outside channel. Strikers: Faris and Saed Diaz were both listed as questionable with soft tissue injuries, Yomi Scintu’s paperwork is not yet fully complete, and Michee Ngalina has been away attending to private family matters. The silver lining is that Fans saw 62 minutes from 16-year-old Jack DeVries and 28 from 15-year-old Patrick Bohui, Bohui becoming the youngest player ever to step on the pitch for Bethlehem Steel. Fans: As is no surprise to those who have studied USL attendance statistics and know that a minor league team playing in its parent club’s market does not do well, official attendance was announced as 737. There was no gridlock entering or exiting parking lot B and patrons were spread from section 104 to 110. Section 103 was this year’s offspring of the East End Army. North Carolina (4-4-2): Alex Tambakis; Alexander Cosmia, Sam Brotherton, Aaron Guillen, D. J. Taylor; Ben Speas, Austin da Luz © (Graham Smith © 90’), Steven Miller (Yamikani Chester 76’), Thomas McCabe; Ulrich Ewolo, Marios Loomis (Robert Kristo 68’). Unused Substitutes: Darrin MacLeod; Dre Fortune, Viktor Igbekoyi, Manny Perez. 737 announced attendance. Sheesh! Probably less than that, I would imagine. . . . Does 737 include Tim Jones? Good reporting as always, Tim. Seriously, does USL championship have attendance clauses or requirements like they do for stadium size and lights? 737 is in line with what other minor league teams get playing in the major leagu club’s home marketon a cold night. And, no, I did not pass through a ticket scanner but was admitted on my credential, press credential, so I shouln’t be in the 737. Eyeballing it out the window that seemed a plausible number. Parking was in the non-handicapped portion of the handicapped lot. I have never head mention of minimum attendance requirements. Google soccer stadium digest. They give USL reported attendance figures. East End Army is still alive, now with additions from SoBs and others who tagged along for the ride. Always appreciate the Bethlehem Steel coverage. Looking forward to seeing this new cast of players develop under Burke! Did you guys drive down? If yes, how was the drive, especially how long did it take? Yep! Drove down. About an hour 20 minutes from Bethlehem, but a few of us live outside the Lehigh Valley closer to Chester. Many of us frequent Union games and are used to the drive.